Housing South Thailand’s most comprehensive collection of ancient artifacts, the Nakhon Si Thammarat National Museum leads visitors through the area’s exceptionally long historical roots. Browse places to stay in Nakhon Si Thammarat on Agoda.com. Free cancellation. Comprehensive English descriptions accompany many captivating statues and other interesting bits, most of which were discovered within the province. 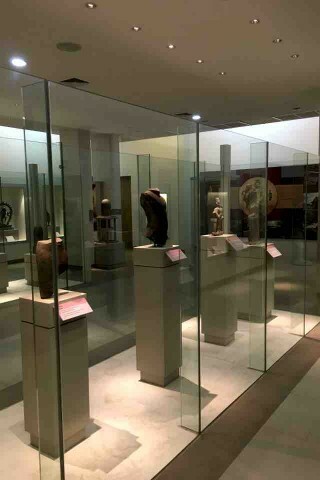 The museum begins with a display on prehistoric life based on archaeological digs, which have proven that people lived in the area as far back as 6,500 years ago. Highlights include a 2,500-year-old bronze kettledrum and necklaces strung with gorgeous polished stone beads in many different hues. Visitors then move into an exhibition dedicated to early religions in the area, including Brahmanism and Mahayana Buddhism as evidenced by the Tambralinga Khindom and Srivijaya Empire. Here you’ll find some of the museum’s most striking statuary, including images of Vishnu, dancing Shiva and phallic Shiva lingam. There’s also a 9th-century stone Buddha head among several ancient Srivijaya statues. The upstairs portion focuses on the area’s prominence in trade and crafts dating back over a millennium. Displays include Ming and Qing dynasty ceramics that highlight maritime trade routes with China, but also Kendi pottery crafted in Songkhla, which shows that the upper Malay Peninsula was not only an emporium but also a production centre in its own right. The museum finishes up with displays on the founding and development of Nakhon Si Thammarat. One info board details the importance of King Sri Thamma Sokarat, who is thought to have overseen the construction of Wat Phra Mahathat. Another discusses an influential monk who founded several local schools in the late 19th century. You’ll also find shadow puppets, silk wears and baskets from the area. Browse our independent reviews of places to stay in and around Nakhon Si Thammarat. Read up on where to eat on Nakhon Si Thammarat. Check out our listings of things to do in and around Nakhon Si Thammarat. Read up on how to get to Nakhon Si Thammarat, or book your transport online with 12Go Asia. Planning on riding a scooter in Nakhon Si Thammarat? Please read this. See below for more sights and activities in Nakhon Si Thammarat that are listed on Travelfish.org. Where are you planning on heading to after Nakhon Si Thammarat? Here are some spots commonly visited from here, or click here to see a full destination list for Thailand.